The Deployment Perspective: Can you get the performance management reports and alerts via a cloud based service? Performance management delivered “FROM” the cloud provides the same advantages that the cloud offers. With a pay-per-use service model, you can turn on/off the service as you require. You can get the service going rightaway, without any upfront hardware or software investment. If you are experiencing performance problems with your critical services and you need an instant solution, performance management FROM the cloud is an ideal solution for you!Our eG Enterprise-on-Tap service provides exactly this. Servers, applications, devices hosted in on-premise networks or in the cloud can be monitored using this service. The Cloud Consumer View: If you are deploying applications on the cloud, you need to know how the applications are performing. If there is a slowdown, you need to know where is the problem – in the cloud? A single business service could even have some applications in the private network and some others in the public cloud. So you need to have a way to be able to quickly correlate between the performance of your applications, the network, the public cloud provider and be able to pin-point the root-cause of the problem. This is performance management “OF” the cloud. Ideally, you would like to have a common management console from where you can see the performance of your on-premises applications and your cloud hosted applications. 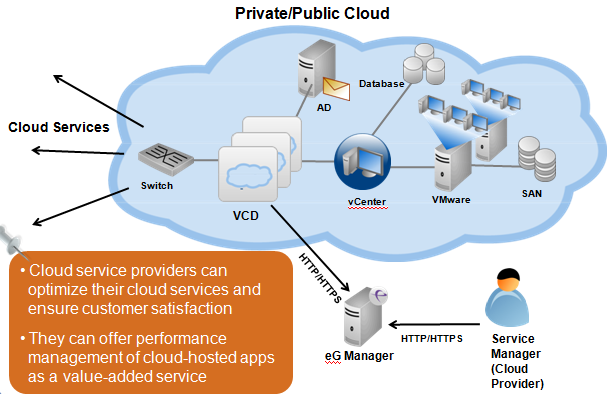 The Cloud Service Provider View: If you are a (public or private) cloud service provider, the cloud is a service you are delivering to your customers. Therefore, your first concern is – Can people access my service? Is the self service portal up? Can users see their VMs? Can users connect to their VMs? If not, you need to be able to determine why the problem is happening – is it the web front-end? is it due to the virtualization platform? is it due to the SAN? etc. The action you take depends on what you diagnose as being the root-cause of the problem. Besides problem diagnosis, you are also interested in understanding how you can get more out of your current cloud investments. You want to be able to see how to balance load across your servers to serve a maximum number of users and how you can optimize the capacity of the infrastructure without sacrificing on performance. You need performance management “FOR” the cloud. Of course, as a service provider, you are also looking for opportunities to deliver value-added services to your customers. Offering performance management as a service to your customers, so they can monitor, diagnose and get reports on the applications they have hosted in the cloud is one such service. Not only is this a value-add for your customers, it can even reduce the number of support calls your helpdesk gets. If you can educate your customers to look for specific patterns that indicate whether it is a problem with your cloud service or not, you can get them to call your helpdesk only if a problem pertains to your cloud service. In all other cases, they must diagnose what is happening with their applications! Each of these perspectives has their unique needs. 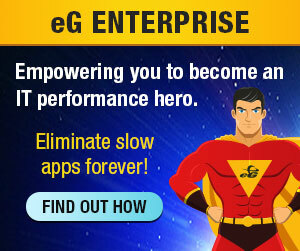 eG Enterprise is a unique solution that can provide you performance management FROM the cloud, OF the cloud and FOR the cloud!